Sebastian Maniscalco is a stand up comic artist by profession and has achieved a thriving career in comedy after experiencing a slow beginning. His great determination for success and a diligent attitude to work landed him a role in Vince Vaughn’s comedy movie titled Wild West Comedy Show: 30 Days & 30 Nights – Hollywood to the Heartland. Following his extraordinary display of unique talent in the movie, the skilful comic artist was publicly acknowledged, leading to his meteoric rise to superstardom. Maniscalco is also a podcaster as he co-hosts along with Pete Correale on ‘The Pete and Sebastian podcast’. More so, the brilliant comedian has made appearances on a few movies as an actor including, The Nut Job 2: Nutty by Nature, The Irishman, Greenbook. Over the years, the adept comic artist has gone ahead to release five comedy videos with his recent Netflix special titled Stay Hungry being dropped on 15th January 2019. 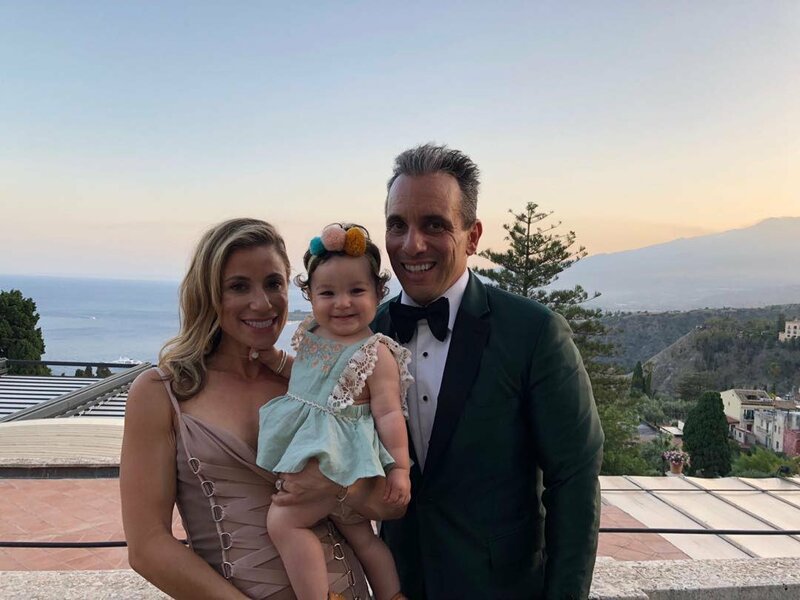 Read on as we unveil more facts about Sebastian Maniscalco’s early life, career and family. Sebastian Maniscalco who is of Italian-American ethnicity was born to Salvatore and Rose Maniscalco in Arlington Heights, Illinois, Chicago, United States of America, on the 8th of July 1973. He is an American national. Maniscalco completed his basic education from Rolling Meadows High School and furthered his studies at Northern Illinois University. By 1998, the famous comedian kick-started his career with a slow beginning, having participated in open mic shows held in bars and bowling alleys when he relocated to Los Angeles. In order to make ends meet, Maniscalco started serving as a waitperson at Beverly Hills’ Fours Seasons Hotel and later left the job in 2005, after serving for seven years. The comic actor began his walk of fame when he bagged another job at the Comedy Store in West Hollywood and was made a frequent performer at the venue. In addition, Sebastian Maniscalco has also staged a 30-minute comic show for Comedy Central Presents. By 2009, he released his first comic video titled Sebastian Live, which lasted for four hours. He then followed it up in 2012, by dropping another comedy special, What’s Wrong with People? From 2014 to 2016, Maniscalco went on to release two more comic videos called, Aren’t You Embarrassed? and Why Would You Do That? Furthermore, the TV figure was among the four comic artists who were cast to play a different role in Vince Vaughn’s comedy movie, Wild West Comedy Show: 30 Days & 30 Nights – Hollywood to the Heartland. The three other comedians are John Caparulo, Ahmed Ahmed and Bret Ernst. Throughout his career as a comedian, Maniscalco has made appearances on numerous comedy shows such as The Late Show with Craig Ferguson, The Jay Leno Show and The Tonight Show starring Jimmy Fallon. Additionally, the Illinois-born comedian is also working as an on-air host of a comic program – Raw Dog Comedy at Sirius XM radio station. In his career pursuit as an actor, Sebastian Maniscalco has played a role in season 7 of the TV show, Comedians in Cars Getting Coffee and also in movies such as TAG, Cruise and The Irishman, alongside Robert De Niro, which will be premiered in October 2019. More so, on February 27, 2018, the brilliant actor released the publication of his autobiography entitled ‘Stay Hungry’ and in the next year, a comedy special which goes by the same title was dropped by Netflix. As a result of Maniscalco’s growing popularity, his comic specials have been bought over by Netflix, thereby, selling the talented stand-up comic artist to the world. The highly skilful comic artist has done well for himself over the years through his impressive body of work. Following the release of his five comedy videos along with his appearances on several TV shows and movies, Sebastian Maniscalco has constantly made bank with his net worth pegged at $6 million as of 2018. See Also: Adam Scott (Actor) – Bio, Height, Age, Wife, Kids, Siblings, Family, Is He Gay? The popular comedian is happily married to Lana Gomez, who is an A-list painter and whose lovely artworks have been published on the reputable interior designer, Kelly Wearstler’s book, ‘Hue’. She became famous as a result of her creation of towering 10-foot guitar sculptures in Guitar Town, West Hollywood, where she also situated her showroom. Gomez has made a name for herself as she was publicly recognized with the Tastemaker of 2014 award by California Home and Design Magazine. The duo tied the knot in August 2013 and they have a daughter named Serafina Simeone Maniscalco, born in 2017. With regards to Sebastian Maniscalco’s father, his name is Salvatore Maniscalco and there are no further details available about him.